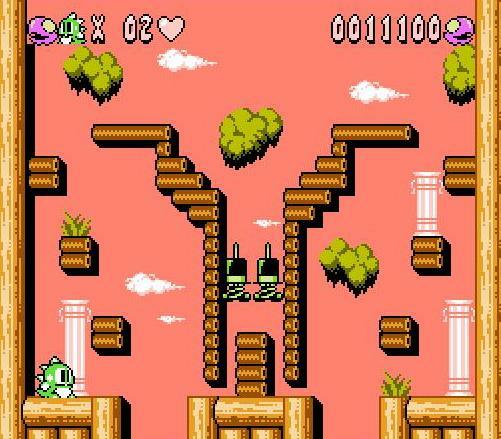 In reality, I've attempted to play--and enjoy--Bubble Bobble 2 a number of times since its release 24 years ago. Sadly, each attempt (made via emulation, I have to add; I haven't yet gotten up the nerve to drop a few hundred dollars on a game I've long struggled to like) ended with me shaking my head in disbelief, wondering how the masters at Taito could've screwed up so badly. What do I mean by "screwed up"? 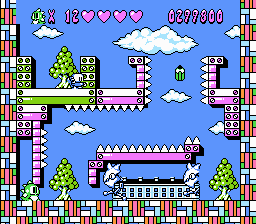 Consider Bubble Bobble 2's graphics. Anyone who tries to tell you they even approach the kaleidoscopic adorableness of Bub's and Bob's first foray into the "cave of monsters" is someone you shouldn't trust, in my humble opinion. 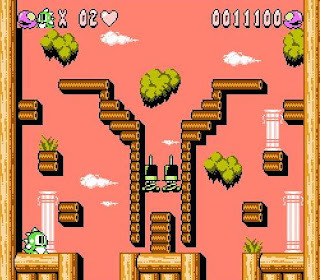 Heck, I'd go so far as to say I prefer the aesthetics of the Rainbow Islands Famicom port to those of the game discussed here, and that particular home version of the official Bubble Bobble successor isn't exactly known for being a looker (especially when compared to its quarter-munching counterpart). 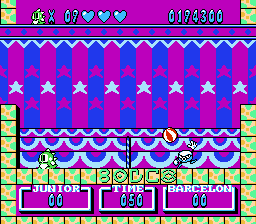 Another visual aspect of Bubble Bobble 2, aka Bubble Bobble Part 2 outside of Japan, that's kept me from warming up to it as much as I thought I would when I first became aware of it: its sprites. They're all out of whack in terms of size. Specifically, Bub and Bob appear to have gained a few pounds since their initial go-round, while their well-known adversaries seem to have been zapped by some sort of futuristic shrinking ray. 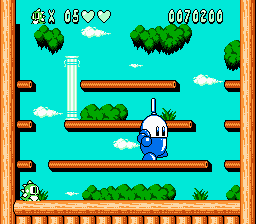 That's not the end of the world, admittedly, and if you're like me you'll get over the questionable art direction in time, but even then it remains one of the ugliest Bubble Bobble games around. 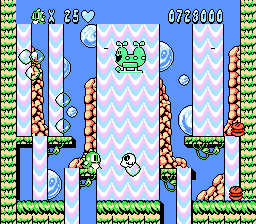 The worst offender when it comes to Bubble Bobble 2's looks, though, is its lazy backdrops. Although a couple of them are nice enough, they stick around for so long they become boring. This is especially true of the yawn-inducing, column-filled environment that opens the game. It barely changes while you progress through the first 10 levels, and when you finally make it to the 11th, the sky color switches from blue to coral and that's it. Later stages offer backgrounds that are far more interesting, thankfully, but even they tend to overstay their welcome. The good news amidst this deluge of negativity: all the complaints I've leveled at Bubble Bobble 2 so far are merely cosmetic. (That's not to say I can't think of a few others, such as its lackluster soundtrack and its abundance of flicker.) Even better, they irk you less and less the more you play the game--or at least that's been the case for me. As an example, I currently consider the Bub (or Bob) sprite to be kind of cute, which is worlds away from my initial, horrified response to it. 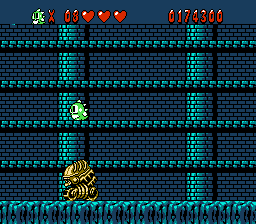 Also, Bubble Bobble 2 is an enjoyable enough single-screen platformer even though it's far from the most attractive one around. That's largely because of how bizarre it eventually shows itself to be. How this fits into Bubble Bobble 2's overall story, I cannot say. I can say, however, that it served as a turning point in my relationship with this odd duck of the Bubble Bobble series. After encountering that Alien-esque boss--as well as the enemy that looks like a mashup of a Star Wars AT-ST and a Zen-chan as well as the one that seems to be made up of a skeletal head, a chain-link body and bony little legs (again, see screenshot above)--I developed an appreciation for Bobble Bobble 2's unapologetic wackiness. I'd still rather play the original Bubble Bobble, Rainbow Islands or Parasol Stars, mind you, but I think it's safe to say I'll toss this 1993 release into the mix now and then thanks to my most recent--and mostly positive--experience with it.